1 oz lot of 20. 1 oz lot of 25. 1 oz lot of 100. 1 oz lot of 500. Beautiful rendition of Lady Liberty, admired by investors and collectors alike for its stunning beauty! This first year issue of this design has been authenticated and graded as Choice Brilliant Uncirculated MS-63 by NGC. This coin was originally designed as a high relief and looked more like a medal, but was lowered for a number of reasons namely because they did not stack well and because they had to be struck multiple times which wore out the dies quicker than normal. 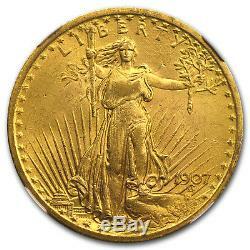 Due to this fact , Saint-Gaudens had to redesign the coin. He lowered the relief so that these coins could be easily stacked and struck. This coin is considered by many to be the most beautiful American coin ever produced. 1907 Saints and some 1908 Saints do not bear the motto "In God We Trust" as it was not required by law to use this motto on coinage. President Roosevelt even defended Saint Gaudens' omission by stating that it was a profane use of God's name. Each package is fully insured. There are no exceptions to this rule. The value of a Bullion Coin e. American Eagles or Canadian Maple Leafs is affected by many economic factors, including the current market price of Bullion, the perceived scarcity of the Coins and other factors. Some of these factors include the quality, and current demand and general market sentiment. Therefore, because both Bullion and Coins can go down in price as well as up, investing in them may not be suitable for everyone. Because all investments, including Bullion and Coins, can decline in value, you should understand them well, and have adequate cash reserves and disposable income before considering a Bullion or Coin investment. Please consult your financial advisor. Definitions The following terms have the following meanings in these T&C: 1. The term "APMEX" means APMEX, Inc. The term "Bullion" is used to describe (1) Gold, Silver, Platinum or Palladium Coin(s) which closely follow spot prices and have little or no Numismatic value (such as restrikes); and (2) the form in which metal is shaped such as bars, ingots or wafers. The term "Coin(s)" means a stamped piece of metal of a known weight and fineness issued for commerce by a sovereign government. The term "Fair Market Value" means the Fair Market Value of the Product as determined by APMEX, in its reasonable discretion, as of 5:00 p. The term "Numismatic Coin(s)" means a Coin, the price of which depends more in its (their) rarity, condition, dates, and mint marks than on their gold or silver content, if any. The term "Precious Metal" means Gold, Silver and Platinum along with the Platinum group of elements: rhodium, osmium, ruthenium, Palladium and iridium. Precious Metals are characteristically lustrous, ductile, rare and nonreactive. The term "Semi-Numismatic" means a Coin that has both Bullion and Numismatic value. No other relationship, including, without limitation, any agent-principal relationship, any employee-employer relationship, any franchisee-franchisor relationship, any joint venture relationship or any partnership relationship, between APMEX and you exists. You may not assign any of your rights or obligations under these T&C without the prior written consent of APMEX, which may be granted or withheld by APMEX in its sole discretion. This contract, including but not limited to the T&C, shall be binding on all permitted assigns and successors of APMEX and you. It is APMEX's goal that any disagreement or dispute be resolved expeditiously. If an amicable resolution cannot be reached, you agree that any and all disagreements and disputes between us shall be resolved in accordance with the following paragraphs: (a) Forum Selection and Governing Law. All such disputes shall be resolved exclusively in such federal and state courts, as appropriate, in that jurisdiction. You hereby consent to personal jurisdiction and venue in those federal and state courts for the purpose of resolving any disagreements or disputes between us and waive all objections to the jurisdiction of such federal and state courts. Any action arising out of or relating to these T&C shall be governed by, and interpreted in accordance with, the laws of the State of Oklahoma, without regard to conflict of laws principles. The section headings are included for ease of reference and do not affect the interpretation or the scope of these T&C. These T&C are intended to be enforceable to the fullest extent permitted by applicable law. If any term of these T&C is held to be unenforceable for any reason, such unenforceability shall not affect the other terms of these T&C, and the term that would otherwise be unenforceable shall be enforced to the fullest extent that it would be enforceable. APMEX may amend these T&C at any time by posting the amended terms on the website, and such amendments shall become effective immediately. If you become aware that you may be required to make any disclosure of such information, including, without limitation, as a result of the receipt of a subpoena or other compulsory process, you shall promptly notify, in writing, APMEX and you shall cooperate, in good faith, with APMEX in obtaining a protective order or other appropriate relief, if any, with respect to such disclosure. 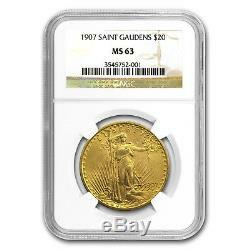 The item "1907 $20 Saint-Gaudens Gold Double Eagle MS-63 NGC SKU #45872" is in sale since Wednesday, November 8, 2017. 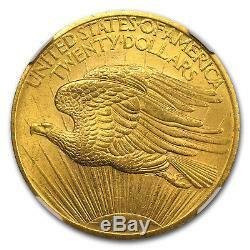 This item is in the category "Coins & Paper Money\Bullion\Gold\Other Gold Bullion". The seller is "apmex" and is located in United States. This item can be shipped to United States.